Caring for your children is time consuming and exhausting. That's why most of the things you buy to help you look after your children are based around saving time and making things as simple as possible. The best bottle warmer is just like that. Everyone can heat up a pan of water and use a thermometer, but it's time consuming, imperfect, and you have to keep coming back to check temperatures, set timers, all of these things. Instead, a bottle warmer is normally just set and forget. All you have to do is fill it with water, throw a bottle inside and turn it on, and it does all the hard work for you. It's literally the simplest thing in the world, and when you think about how many times a day your child needs feeding, and add up the minutes you save, the difference is staggering. It's not surprising then, that we consider these an essential tool for any mom, whether this is her first time or she's got previous experience. Just like every baby product on the market though, there's a huge amount out there, with loads of variation between them. That's where we come in, to tell you in plain language what to look for, and why you might want each warmer we've recommended. Read on to find out what you should look for and why it's important. Most warmers do roughly the same job, but there's a few things that you should pay attention to when buying it. For example, there's several different methods that can be used to heat the bottle, which can be important. Read on to find out what you should be looking for. First off, you're going to be using this a lot, so pulling it out of the cupboard to sit it back on the counter a dozen times a day will soon get boring. You're going to want to leave it on the sideboard, so consider how big it is and where you're going to put it. Sometimes you'll also need access to the sides of the warmer, and they can throw out a lot of heat, so you might also find yourself pulling it closer to the edge, so it doesn't get steam on the underside of wall mounted cupboards, for example. In this case, mobility and stability are key. Is It Compatible with Any Bottles You Already Have? They aren't universal. Most of the products we recommend come from the major brands, because they're more likely to know what they're doing, and we trust them far more. Because of this, you'll find that brand names make models that first work alongside their own bottles, and tend to work with most standard sizes on top of that. If you've already ﻿﻿bought bottles, double check that they will fit. How Long Does It Take to Warm up a Bottle? The difference between three and four minutes doesn't sound like a lot, until you've got a grizzly baby or two in your arms. Obviously, the faster the better. Especially if, like we said earlier, you're going to be using this several times a day. Every minute you can grab from somewhere is going to be appreciated. How Simple Is It to Use? Now, they aren't usually hard to use, but some are much easier to use than others, to the point that you can go from start to finish with just one hand, which is an option you'll really come to love. It's also worth checking how easy they are to set, and whether there are any other benefits. For example, some warmers remember your settings, which saves more time. How Safe and Healthy Is It? None are unhealthy. We'd never recommend a product that was bad for your baby, after all. But some use different methods to heat up the bottles inside. The usual method is steam, but we've also seen warmers with water baths. In general, gentler temperatures and less harsh methods are better, if you can get them, because exposing milk, whether formula or breast milk, to hotter temperatures, can destroy some of the valuable nutrients it contains. Does It Come with Safety Features? There's a lot to look out for here, and none of them are essential, but all are useful. You might find warmers with alarms that sound when it's finished. Obviously, you don't need these, but it makes it so much easier because you can just set it and go see to your children. One thing we would recommend is an automatic shut off, if you can get it though. It's just an added safety net. You might not think that you'd ever leave it on, but it's easy to forget something when you're making up a bottle all blearily eyed in the middle of the night. Now you know what you're looking for, we can move on to our reviews. Each of the products below was chosen for a specific reason, whether that's portability, ease of use, or simply being the best warmer we've found, so make sure you read all of them to find out just which is perfect for you. Widely considered one of the most practical, affordable and compact options you can buy, there's so much to recommend about this, it overrides any minor problems it might have. First, there's the huge advantage that this isn't just a bottle warmer. It can also be used as a baby food warmer, and a steriliser for pacifiers, straight out of the box. This saves you so much time, counter space and money it's unreal, and if you were considering buying a baby food warmer anyway, then why not consider just grabbing this for both. It fits pretty much every bottle we've found, including even the biggest ones, so no matter which bottles you've bought your baby, this will work. It uses steam to heat the bottles, which works quickly and really well. It can go from cold water to full steam in around 30 seconds, and only takes a few minutes to warm the bottle from there. The only real downsides with this warmer? It can get quite hot, so make sure you check the temperature of the milk before you start feeding. (Though you were probably doing that anyway...) And you have to measure the water out before you use it ever time, though we propose a smart fix for this. The measuring thingy clips to the outside, so just fill it up after you're done using it, so it'll be ready to go next time. Trust us, when you're heating a bottle at 3am, you'll thank yourself for doing this! Apart from these tiny things, this is a top choice. It heats fast, it's reliable, it's got an auto shut off, and you can use it for so much else. If you're looking for a steam warmer that's incredibly convenient and easy to use, then you're going to want Dr Browns. It's packed with smart options that make using this a breeze, perfect for a baby that prefers night feeds. For a start, it's incredibly easy to use. Once you've set it, it remembers everything, so all you have to do is put a bottle in and press one button, and it'll start working. Second, it's got a large water reservoir. Easily enough for several uses, normally around 9 or 10 bottles. So there's no running backwards and forwards or messing about with refills when you've got a cranky, hungry baby on your arm. Last, it heats really quickly because it uses steam. It may or may not be the fastest, but heats a bottle from frozen in as little as 5 or 6 minutes, which is quite frankly incredible. When you also figure in the fact that this can be used for baby food as well as milk, and comes with smart safety features like an alarm for when it's finished and an auto shut off, it's a no brainer. The only time we wouldn't recommend this? 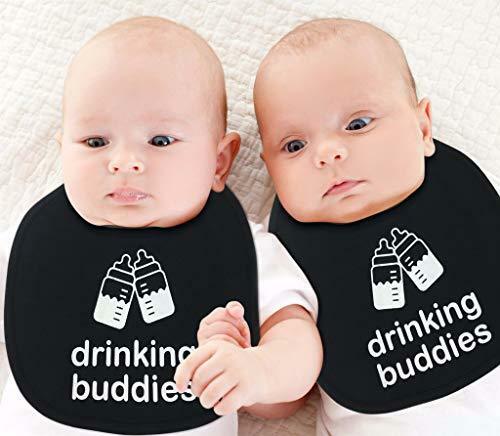 If you've already bought Tommee Tippee bottles. They're just slightly too large to fit inside this. It takes pretty much every other major brand though, so if you've got anything else, this is a wonderful choice. 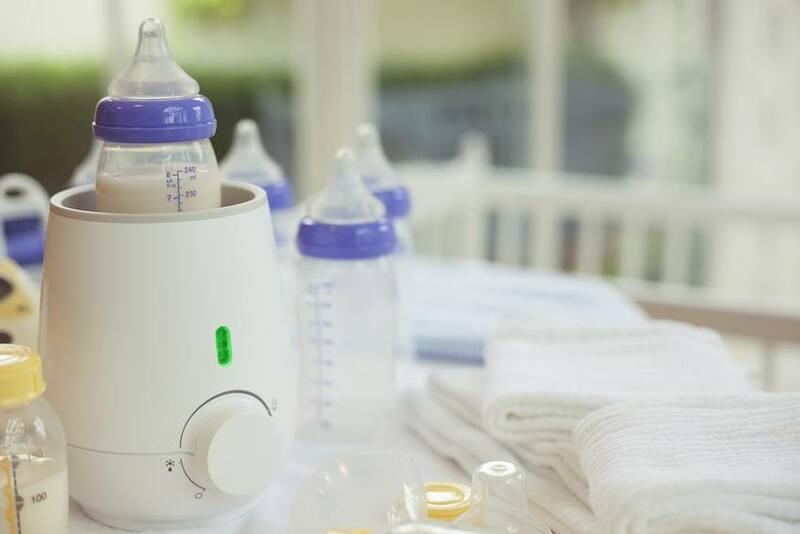 Tiny, cute and easy to bring with you, Philips AVENT is great for anyone who leaves the house fully packed often, and needs one they can bring with them. It's also notable for another reason. The speed it warms. It's one of the fastest we've ever seen, and can warm 4 or 5 ounce bottles in as little as 3 minutes. It's also got a really smart function that circulates the milk as it's being warmed, which leads to a nice even temperature, rather than the cold and hot spots you can sometimes get with cheaper options. It fits any Philips bottles, and most others, so you won't have to worry there, especially if you've already bought. Plus, this is pretty simple to use once you get used to it, with a simple dial and one button activation. Although the first couple of times you use it, you might wonder if it's done, because the LED that tells you how hot the milk has got can be deceiving. But once you've got used to that, this is a wonderful little item. It's small, easy to use, and warms really quickly. What else could you ask for? Designed from the ground up to follow the CDC's guidelines for breast milk, if you want the safest and healthiest option for your baby, then Kiinde Kozii's model is probably your number one option. It's a good choice on top of this for a few other reasons, too. For example, the universal warming chamber design is supposed to fit any bottle or milk bag on the market, so you won't have to worry about your bottles not fitting this. Unlike pretty much all other bottle warmers, this doesn't use steam. Instead, there's a 'bath' that you sit the bottle in, which is circulated around the bottle to heat up the milk inside evenly and safely. Because there's no steam, there's supposedly no temperature variation, which means that none of the nutrients in the milk will be damaged. Be careful with the timer though. The manufacturers recommendations are a little out, and recommend longer times than you'd expect. Normally, this wouldn't be a problem, but you can't adjust the timer once you've set it, and taking the bottle out early can damage the machine, so make sure you've set it right. Just fill a couple bottles with water and play around when you first buy this. Once you've got past this little issue though, you're ending up with an amazing little warmer that works fast, works incredibly well, and is as safe as you can get. If you're the sort of mom that goes everywhere prepared and ready, with everything packed, then you're obviously going to want a portable bottle warmer. And there's no better option than Tommee Tippee's travel warmer. It's robustly designed, obviously because it's going to take a few more beatings than a standard counter sitting option. It's also completely free of anything that might hurt baby, like BPAs. So simple to use, you're going to love the convenience. It's basically a large, specially designed stainless steel Thermos with a bulletproof locking mechanism and an outside sheath cover that you reverse to put the bottle in with the hot water. All you do is boil some water, fill the Thermos and lock it down, where it will stay hot for hours. When baby gets hungry, pull the cover off and put it down somewhere stable, click the button at the top to unlock it, pour the hot water into the covering, then put the bottle in. That's it. So simple. So effective. No matter what bottle you use, it's going to fit into this, and considering how inexpensive it is, I'd say it's an essential part of any mom's baby toolkit. This warmer and sterilizer has a large capacity and can accommodate up to 4 bottles of standard sizes and accessories. It is made with high-quality materials and has a transparent body as well as a convenient to carry handle. It features a 4-in-1 function such as a heater, warmer, sterilizer, and bottle storage. It also has an LCD display with digital controls. There is no signal or sound that tells you it is done heating and sterilizing the baby bottles. You may also find that heating takes quite a while to finish. You might have to start ahead before your baby gets hungry. There is no clear instruction on how to drain the water, clean, and maintain it, which is very important. It could be a baby food warmer as well, but there is no instruction about that either. Overall, it does its job well and is a great product overall for its price. You do not have to buy separate sterilizer or bottle storage. It gives you value for your money. This has a 4-in-1 function such as “warm milk”, “heat food”, “milk formula” and “sterilization”. It is designed with a knob that enables you to use the functions. You can also adjust the temperature accordingly so you do not overheat drinks or food. It has a reversible lid and is large enough to accommodate bottles of different sizes or heights. It can also heat up baby food and milk at the same time. One great thing about this is the automatic shut-off feature that is a great safety feature especially when the water evaporated or after the water boils. You do not have to run to plug it off. It is very easy to use and clean. It would only take you a few minutes to operate and warm or heat your baby’s food or milk, which is very helpful during night time feeds when your baby is too hungry to wait. You may find the temperature control a little bit off, but all in all; the product is safe to use, simple, convenient, and reasonably priced.